PopSockets launches a new collection with crystals from Swarovski, the must-have accessory for the Holiday season! 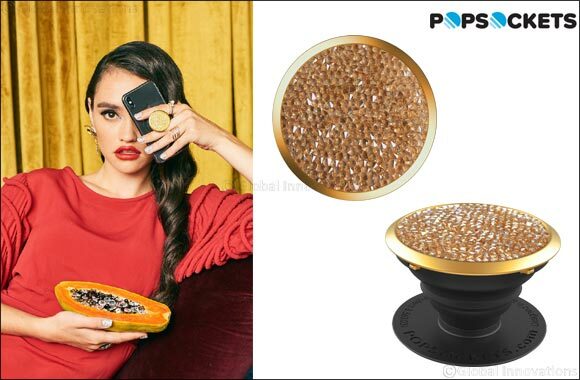 December 06, 2018: PopSockets; the makers of popular collapsible phone grips, loved around the world by celebrities such as Gigi Hadid and Kylie Jenner, are thrilled to announce the release of their glamourous capsule collection adorned with Swarovski crystals– just in time for the holiday season. Having launched in the US last month, the shimmering luxe-range is making its way over to the GCC, available in a variety of eye-catching crystal colours, including; Golden Shadow, Silver, Jet-Black and Siam Red; the collection will be available from November- just in time for the holidays. The Siam Red features a unique three-way shimmer effect that reflects different colours, such as silver and pink, depending on how the light refracts off the Swarovski crystals. Small, customisable, and highly functional, the PopSocket Grips phone accessory makes the perfect stocking-stuffer, and now available with the premium sparkle from Swarovski crystals, there really is something that suits everyone. Whether it’s adding some sparkle to brighten up your handset, or bringing some glam festive flair to your winter wardrobe – the new crystals from Swarovski range is available for 229 AED.